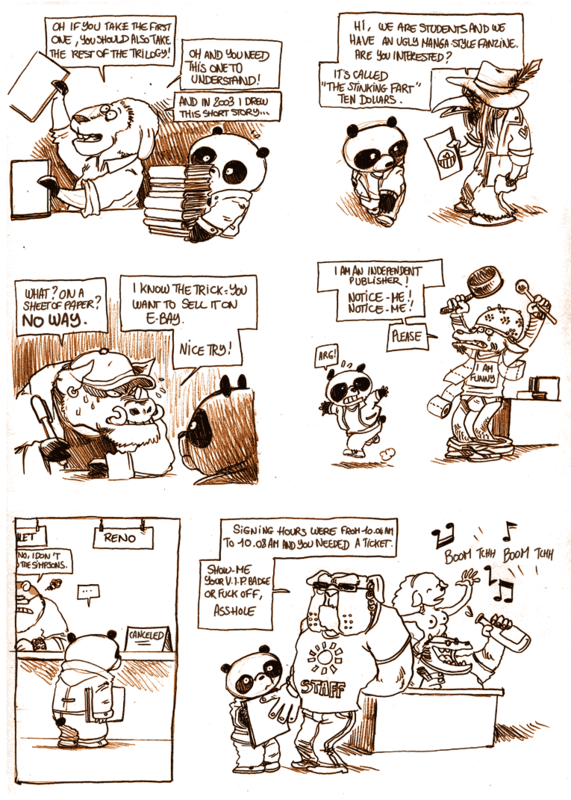 This comic was a tricky one, I hesitate to translate it. I drew it because some people told me they were uneasy with my comics about the public going to comic conventions, they thought it wans't nice of me to make fun of them. Of course, when we tell a story, we tend to focus on funny things, awkward moments... It doesn't mean I don't like conventions and meeting people. I love meeting people, otherwise, I wouldn't go there ! 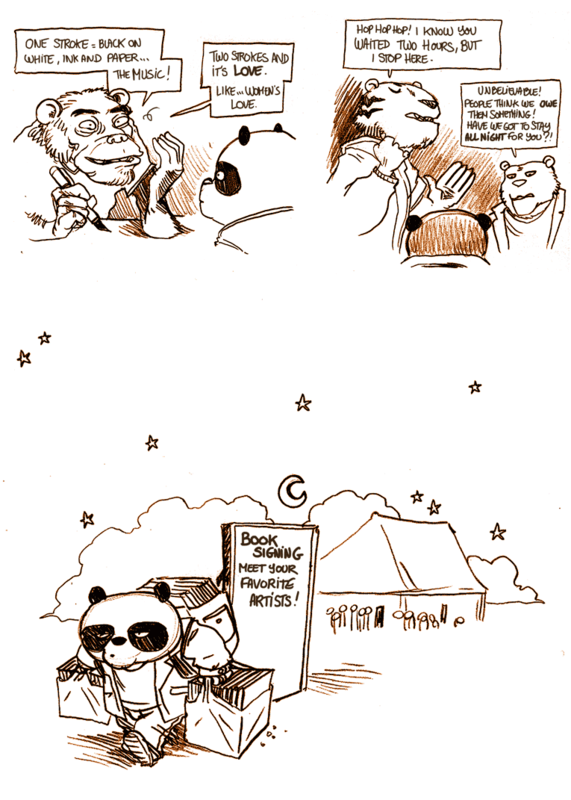 So to be fair, I did this comic about authors I met or I heard when I was in festivals. It's the same thing: they are short moments, sentences taken out... Caricatures ! For example in real life, the guy with the Ebay paranoïa took a deep breath, and said he was sorry, and did a drawing to the person. Anyway, I don't really know if it applies for US or UK cartoonists, maybe they are very different, I don't know. Comics Convention are really not the same in France... Except maybe Angoulême, which is a big thing, they are usually smaller, and there are a LOT. You can go in a comic festivals every week-end of the year and you'll still miss some. We don't have to much of the "convention" aspect. People don't do cosplay, it's more a Manga-convention thing. And more important, authors give drawings for free, you don't have to pay for a signature or a little sketch. Some of my friends were invited in San Diego for their comic "Lucha Libre", and they started to sign figurine boxes for free: american authors went mad at them, and came to tell them to stop, because it was unfair. No need to say that my friends were very surprised ! It's very strange to see the diffences: for example, japanese famous authors are like rock'n'roll stars. One year the author of the manga "Fruit Basket" went to a book convention, and we (french authors) were asked to leave the publisher's VIP-room because she wanted to be alone to rest. Once again, it was very surprising for a french author. In France cartoonists aren't stars, the very famous ones sit at the same table as the others. I'd be curious to know if english or american people can relate to that comic ! Well, I'm French, and I'm not going to any Comic Conventions apart from the Japan Expo/Comic Con (and spend my whole time in the Comic con part of the festival). You know, being 17, student, all that, it doesn't allow me to travel much outside of Paris, so it's kinda hard to go to other festivals, although I'd love to go to Angoulême, and try Lille's Comic Festival for once. At the Comic Con Paris this summer, I was mostly there because of comic artists I love (Lee Bermejo, Nei Ruffino, J Scott Campbell, Adi Granov...). I queued twice for Nei Ruffino, she didn't have a lot of people waiting cause she's not really known (I think?) in France, and she's mostly a colorist. But she had enough people waiting to make me be the only person left when she had to go, and I couldn't have any drawing since she was in a hurry. Happened to me both on Friday and on Sunday. A few days later, she was having a colouring session on Livestream, and I could chat with her a little. She spoke about the Comic Con, and she said it felt weird having to draw all day, for free, unlike American conventions, though she was really sorry she couldn't draw anything for people still waiting when she had to go. I know you drew stereotypes in your comic, but that's interesting to see how authors can be similar or different from those. I'd be curious too, to see how Americans can relate to this post. When Nei Ruffino said she wasn't used to drawing all day for free, I was really surprised to acknowledge the fact that American artists usually don't do this. There's something more familiar, (convivial?) with the French system. Caroline: yeah, I prefer the french way too, for the conviviality, but this system has its flaws too. 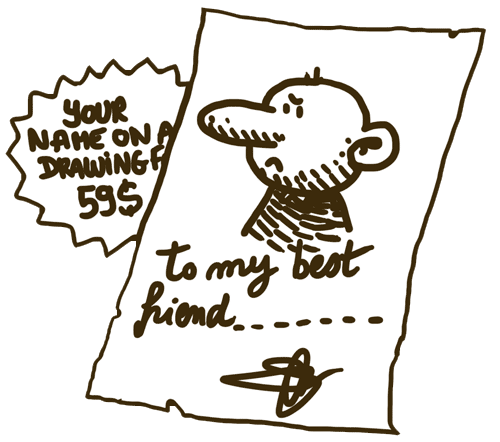 Cartoonists always have a hard time to explain that "drawing comics" is a real job, and that system,drawing for free, tends to confort the public that drawing is a cool easy thing you do for free. I often have mail asking "could you draw me something for a birthday/greeting card/logo for my company/tatoo/design for a T-Shirt, I don't have any money but I love your job" At least americans are fair: book writters sign books, they don't write you a short story inside the cover. So if cartoonists are actually drawing, they get paid for that. And it can really help young cartoonists, who rely on that to make a few bucks ! I think I wouldn't mind if it were the same in France. But I don't think it could work. In France we hate talking about money, we have a strange relationship with it. One of my friends, Thomas Cadène, got insulted a few times because he had launched the first paying webcomic in France (les Autres Gens) and people didn't understand why they should pay for something on internet. I don't think it would be shamefull to ask people money for drawings, but I think a lot of people wouldn't understand, would be shocked, or even furious. So of course I love the french system, but sometime I force myself a bit into thinking that it's because it's nice to give for free, it's nice to make somenpeople happy. Not because, as my cynism is telling me, people think our work doesn't really deserve money and we couldn't sell any drawing anyway ! The link is still there. You just have to click on the comic. Dear Boulet, I spotted one "shell" (uh uh uh) with the monkey line in the end : one stRoke, two stokes. If you can still fix it with Photoshop or something. Also, do French people have to write you in english too ? Just a question. Thank you anyway. 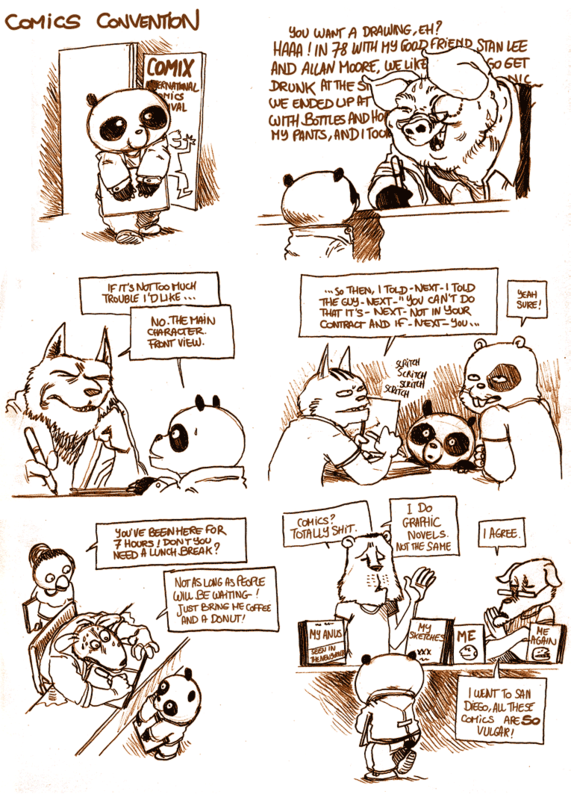 Hi Boulet As your original strip describes some european artists behaviors when they attend a french comic con, there is no need to change artists names and even the currency. In fact, in this particular case, I think changing names and currency is just a nonsense. Today Wikipedia (or, let's say, Google translate) can help curious people to know who are Walthéry, Widenlocher or Titeuf, or basically what is a euro. Have a nice day. Great comic ! I'm from Angoulême, so I'm going to the comics’ convention every year since more than 10 years now. And I can say from experience that all this situations are completely true. I think I can put a name or a publisher on each frame. In the other side, there are so many awesome situations: - The 2 pages drawing full of glittering colors. You have to wait 1hour before the drawing is dry and you can close your comic book. It's kind of a mission to avoid the crowd and protect your treasure. - The 1h drawing which end up with a tiny drawing in black and white. But you don’t care because it’s your fault; you spoke all the way with the cartoonist. - To see cartoonist during the night, get drunk with them, and wave them the next morning when they are drawing with their headache. - All the mistakes you will have on your name, especially with Asian cartoonists - ... By the way I have some old sketches from you Boulet. Three sketches from 01/2002, 01/2003 and 01/2004. And I noticed two things : - The sketches get more detailed each year. - Each sketch is numbered. I have 309, 828, 1923. Are you still numbering them ? It will be interesting to know the number now :-) I appreciate your work. All the best and see you maybe in one month. I love this page. Some many different characters, so many different reactions. But I agree with Laurent, you should have keep the real names on the second panel. And for the panel with the snobbish guys, it's not as funny as in french, but I understand it's hard to translate (do this kind of snobbish exist outside of our country anyway ? ;) ) I have no opinion about the subject cause I've never attended to this kind of convention and don't intend to (well, never say never...). But I agree with you when you say the more important is the conviviality. I guess the chat and the meeting with the author is more important than the drawing itself, for the fans. By the way, you might be interested in this article I read the other day : http://www.actuabd.com/Delaby-Xavier-Le-systeme-de-la (Delaby looks like the "ebay-paranoid guy", lol). Note that I've only been to two "conventions": a small french comic book signing in Montreal, and a big role-playing game convention in Milwaukee (this last many years ago). In both places, the signing was free as far as I remember but it was strongly "encouraged" to buy a book there for it to be signed. That seemed fair to me. Also, I'd assumed that the authors that were there were being paid by the convention organiser (at least, the trip itself)? And I think as well that some or all of the authors might have been there as part of an arrangement with their publisher (an obligation as part of the contract signed between the auhtor and the publisher to do a certain number of conventions/marketing events), but I'm not sure of this last one? Is this the same way it works in France? Or do the author do the conventions mainly because they like meeting their fans, as opposed to (in addition to) doing marketing for their books or making money? In France all charges are taken care of by the festival or the publisher (train, hôtel, meals). In small festivals it's almost always the festival's organization who pays everything, for big festivals like Angoulême, publishers rent stands and invite their own authors. But the author almost never get paid. (unless he's offered to go in a school to talk with children or speak in a conference). It's quite fair, though, but when you have to go for a 3-days week end deep in the countryside instead of staying home with your relative or work, it can be a tough choice to make ! To get back to the point, oh zut il faut que je parle français sinon je m'en sortirai pas. Donc, je voudrais revenir sur le changement de nom des artistes. Personnellement, j'aime pas trop quand les VF "françise" trop les noms étrangers de peur que le public français ne comprennent pas. Je pense que c'est pareil pour le public anglophone. A la limite pour Titeuf remplacé par les simpson c'est pas trop grave, je pense même que c'est plutôt bien vu. Mais pour la 2ème vignette, je dirais que ça ne fonctionne pas. Pour plusieurs raisons. D'abord, Moore et Stan Lee c'est pas vraiment la même école, et ça ne correspond pas vraiment aux auteurs originaux, en tout cas pas pour Moore. A la limite Stan Lee et Kirby ou Simon, ça passerait. Mais là, le problème c'est que l'auteur est quand même la caricature (sans sens péjoratif) de l'auteur Belge tel que décrit dans Astérix : jovial, bon vivant, aimant la bonne chère et faire la fête avec les amis... Bref, cette figure ne correspond pas vraiment à l'auteur de bd de super-héros des années 60. Mon avis c'est qu'il faudrait garder les noms originaux, en ajoutant la précision "in belgium" ou "in bruxelles", et peut-être changer "my good friends" par "my colleagues" ou équivalent, pour faire comprendre qu'il s'agit d'auteurs de bd. Si ça peut encore être changé bien sûr. Voilà, désolé d'écrire en french. I have to say, this is probably my absolute favorite. The sense of caricature, of personality, the communication of the experience here, I really adore it. its so evocative! And the half hidden view of Boulet the chimp, having to explain he is not working on the simpsons. Perfect. I'm from Brazil, where comics are still struggling to be more widely recognized. Here, reading comics is still seen as a children's habit. Thanks to the internet, though, we have a rather prolific - when compared to the general market - staff of talented comic artists. And in the few comics events we have, the authors are very accessible and friendly, really down to earth. I, myself, befriended a bunch of them. Befriended, as in "come stay in our house at the beach for the weekend" befriended. But although that's a very privileged situation, to be able to become friends with people you admire, I still wish for recognition of comics as art, literature and entertainment to rise and spread. Because, if comics artists in France have a hard time meeting month's end, you don't wanna think about how hard is the life of a Brazilian comics maker. I have seen many comic pics but yours are awesome! !